The utility model relates to the fields of mechanical engineering, vehicles, instrument manufacture and construction, and can be used in technology for damping mechanical oscillations. The utility model proposes a magnetic spring comprising an outer, tubular permanent magnet, magnetized along its axis of symmetry and having a container disposed therein which is made of a non-magnetic material and contains two inner permanent magnets (a first and a second) arranged with their like poles facing each other, wherein the magnetization of the first inner magnet, which is situated partially or completely inside the tubular magnet, is anti-parallel to the magnetization of the tubular magnet, and the magnetization of the second inner magnet, which is situated outside the tubular magnet when the spring is in an initial position, is parallel to the magnetization of the tubular magnet. Additionally, a non-magnetic pad having a thickness of between 0.01 L and L (where L is the length of the tubular magnet) is disposed between the adjacent end faces of the first and second inner magnets, and an end magnetic core is mounted on the end of the tubular magnet where the first inner magnet does not extend out of the tubular magnet when in the initial position. 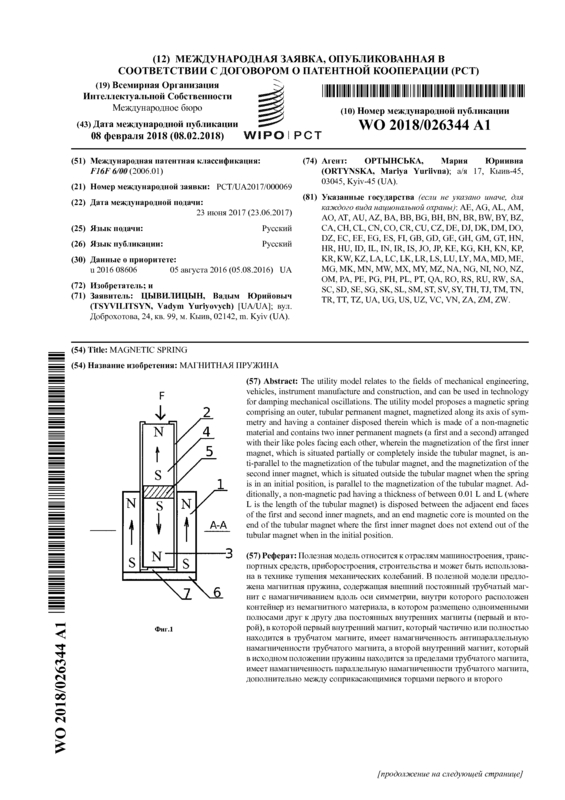 Page created at 2019-04-23 6:45:56, Patent Auction Time.